To protect the passenger compartment, Armortek installs ballistic armor that is available at several different protection levels. The protection level you need is determined by the type of vehicle you want us to armor, how you'll be using the vehicle, and your perceived threat level. We manufacture vehicles to all protection levels based on the internationally recognized ballistic standards of the National Institute of Justice. These also meet the requirements of Underwriters Laboratory in the United States, British Ballistic Standards and German DIN. Ballistics "The ballistic threat posed by a bullet largely depends on its shape, composition, caliber, mass and impact velocity." 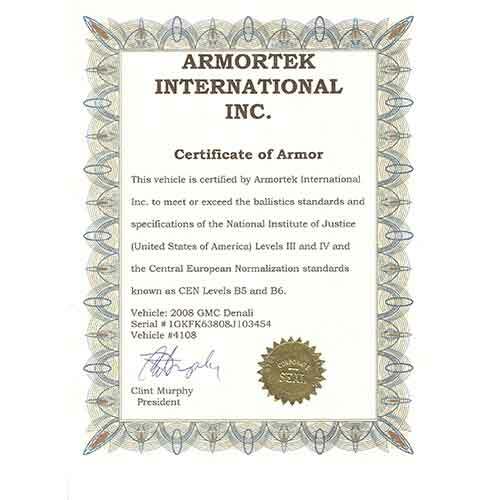 Certificate "We stand behind our armoring process to provide the certified level of ballistic protection that the customer requests"
The ballistic threat posed by a bullet largely depends on its shape, composition, caliber, mass and impact velocity. Ballistic standards exist to ensure that vehicle armor meets the essential requirements to protect against specific threats. 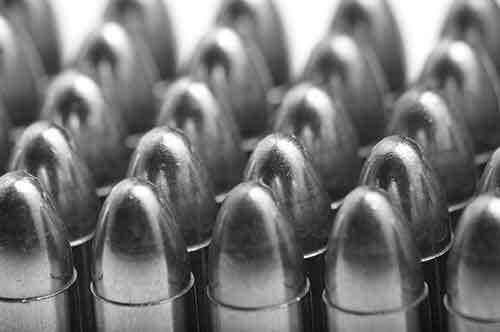 Because of the wide variety of cartridges available in a single caliber, and potential differences in velocity between test rounds and bullets fired in a real-life situation, the armor may not be equally effective against all threats. For example, Level II armor protects against fewer handgun threats than are protected against by Level IIIA armor. If you have any questions about these standards and how the level of armor you choose will impact your safety, we'll be happy to answer them for you. Armortek is committed to the highest quality customer service, and we'll make sure you know exactly what options you have for ballistic protection and work with you to determine the best fit for you and your vehicle.